Everyone keeps thinking that they need some way to trick the search engines into loving them. Although being ‘loved’ by the big G is important, more important is that when you’re found, you’re found for the right reason and that those that find you – were actually looking for YOU. Let me explain. I have a client in Las Vegas that was getting 18k visitors per month to their plumbing site. But the phone was not ringing. So, when I consulted with them, I found that their company name contained the phrase ‘Canyon Ranch’. The problem turned out to be that they were being related to Canyon Ranch Casino. So, the visitors to their website were dulps that were not looking for a plumber, but actually looking for a casino. This had a disastrous effect for a couple reasons. First, now the plumbing company was being categorized by the big G as a casino instead of a plumber. Second, the incredible bounce rate of 99% was wrecking their online reputation and driving them into virtual internet obscurity. So, I don’t want to be negative. I really am posting this to let you know that you can get business to your website without doing the ‘Google Dance’. Simply create good content and get a few backlinks to your content. 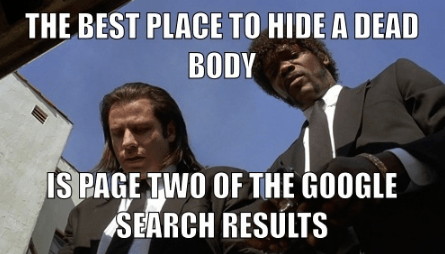 If you do this well, local search results will treat you kindly. The big challenge becomes – how to get great backlinks for your local business. First, I guess I should explain what I consider to be a ‘good backlink’. It should be a backlink from an influential site that is topically relevant or location relevant. Topically relevant – from a site that is on the same topic as your site. So, for a heating and cooling repair company, HVAC-TALK.com would be relevant. Location relevant – from a site that is local to your business. So, the Reno Chamber of Commerce would be extremely relevant to a plumber in Reno. In both cases, not only relevant is important, but also high traffic cost, high trust flow is also important. High Traffic Cost – this is a fun one to explain, but the more authority and traffic a site has, the more it would cost to pay for the same amount of traffic. A great tool for measuring this is SEMrush. They calculate the traffic cost for any domain. If you have a site where you can get a backlink and their traffic cost is over $1,000, it is probably a decent link to have. I have a few sites that I create links with that have traffic costs of $250,000. That’s huge. Trust Flow – now this one is tough to explain too. Trust flow is weighed against Citation Flow. If you have high numbers for both, Google will think that you have audience and trust. That’s a good thing. But if you have a high citation flow and a low trust flow, they will judge you as a weak site. My plumbing company client had a TF/CF of 2/38 when we first started working on his site. If you take 2 and divide it by 38, you get .052. That is terrible. You really want a ratio of over .7 . Now we have it at 32/23 . So our ratio is 1.39 . That, my friends, is off the hook! Have good content on your site. Have great backlinks to your site. The big G will reward you.